Villa UJV 131, also known as Silver Rainbow, is located in the private complex of Domaine du Levant in Petit Cul de Sac, St Barts. This villa has 6 bedrooms, 6 bathrooms and a heated pool. This impressive villa offers a stunning view over the bay of Petit Cul de Sac, the ocean and Turtle Island. A large double staircase, made of China grey stones, leads you to the living room and large terrace with the infinity pool overlooking the bay. The contemporary living room is elegantly decorated with large comfortable sofas, and a massive bar. At the back, the air-conditioned gourmet kitchen is perfect for a chef or food lovers. Opening onto the living and the outside covered terrace, a private dining room with a large wooden table invites you to have dinner while admiring the ocean view. Next door, the Colonial master suite features a 4-poster king size bed and overlooks the dreamy view. Its ensuite bathroom is spacious and has a rain shower, a bathtub, and a large dressing area. On the other side, two connected king size suites with ensuite bathroom open onto the sea view. A junior cottage located above the main house includes two bedrooms. Both offer a king size bed and ensuite bathroom. This cottage also features a kitchenette and a living room. It is perfect for teenagers or a nanny with small children. Above this cottage, located at the entrance of the villa, you will find an office and a fitness room. Villa UJV 131 is an exceptional property hidden in a tropical garden, includes a large semi-circular infinity pool, a Balinese gazebo, and a sundeck with private access to a natural bay. The shared Domaine du Levant tennis courts are within walking distance and located right by the beach. 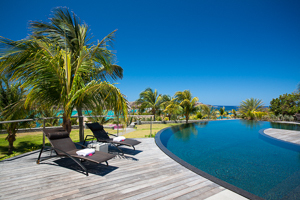 Villa UJV 131 has a 14 night minimum during the Christmas/New Years period. Children under 8 must be supervised by a nanny.